ET NOW, India’s leading English business news channel from Times Network, has emerged as the most viewed channel on the day of the Interim Budget- February 1, 2019. 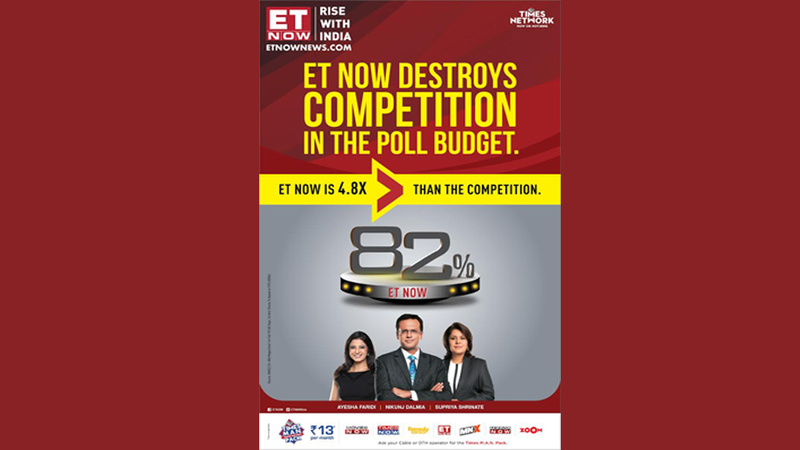 ET NOW, India’s leading English business news channel from Times Network, has emerged as the clear winner for the viewership on the Budget day, February 1, 2019. Leading the Budget day coverage in the English Business News category, ET Now garnered a market share of 73% (Source BARC 22+ AB All India 1mn+, 1st Feb 19, 24 Hrs) and a whopping 82% share in metro cities(Source: BARC 22 +AB, 6 Metros, 1st Feb, 24 Hrs) to become the ultimate budget news destination. Budget speech by Finance Minister aired from 11:00am-1:00pm on 1st Feb’19 was most watched on ET Now with 51% market share (BARC 22+ AB; All India 1mn+). In the build-up to the Budget day with ‘Poll Vault’, ET Now featured a series of shows that focussed on the growth agenda for the government by bringing industry leaders from across sectors face to face with top policy-makers. Following the budget announcement, ET Now was the only news channel to interview the Finance Minister, Arun Jaitley and Former Finance Minister, P. Chidambaram on the day of budget. Commenting on the ratings, Nikunj Dalmia, Managing Editor, ET Now said, “The right blend of content and in-depth analysis by experts and economists has led ET Now to rise ahead this budget. Country’s top policy-makers, including Finance Minister chose ET NOW as their choice is an endorsement of the channel’s preference amongst India’s think-tanks. The massive viewership that ET Now has received for Interim Budget 2019 is a clear indication that we have been successful in delivering the most comprehensive budget reportage to our viewers”. An inclusive public outreach employed by ET Now, with its cutting-edge innovation led to live broadcast of budget for thousands of citizens at Churchgate station in Mumbai. Capturing the economic and political fervour of the Interim Budget with its unmatched content line up, ET Now brought together eminent policy makers, politicians, corporate honchos and think tanks including Jayant Sinha, MP & MoS – Civil Aviation ,Suresh Prabhu, Minister of Commerce & Industry, Civil Aviation, R Gopalan, Former Finance Secretary, Arundhati Bhattacharya, Former Chairman – SBI, Keki Mistry – VC & CEO -HDFC, Subhash Chandra Garg, Secretary of Department of Economic Affairs, Krishnamurthy Subramanian, Chief Economic Advisor, Sanjeev Sanyal, Principal Economic Advisor- Ministry of Finance and Raamdeo Agrawal, MD & Co Founder, Motilal Oswal amongst others.